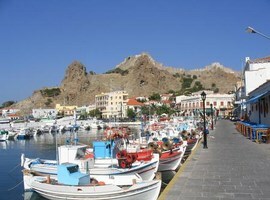 The island of Lemnos is not a usual tourist place but it is much more. The island offers everything a visitor could ask for, from more than hundred amazing golden beaches, combined with clear sapphire waters which create a unique difference with the wild but amazingly beautiful landscape, to plenty of archaeological sites and picturesque villages. The morphology and geography of Lemnos is stunning with its strange capes and the underwater caves like the famous Cave of Philoctetes. 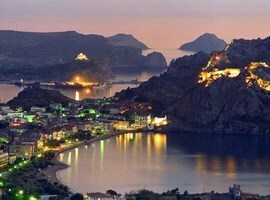 Having successfully kept its traditional beauty and charm, Lemnos can give you a guaranteed refreshing holiday time. It is very easy to find good quality accomodation on Lemnos as the island hosts a wide variety of hotels, holiday apartments and houses, and resorts to pick one. The local restaurants still serve many delicious traditional dishes while their unique flavours will make you ask for more. On the island you can find plenty of archaeological sites like Poliochni, Ifestia and Kavirio which are the most highly visited places and the tourists can also enjoy the three wonderful lakes of the island which create hospitable and beautiful ecosystems with migrant birds that go as groups to the lakes. 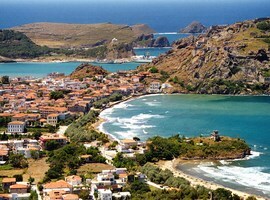 The peaceful island of Lemnos is the perfect choice for a relaxed and refreshing vacation; you can walk in the strange but interesting narrow lanes between streets, to explore the old fashioned but charming towns and markets, to sit in a seaside traditional tavern and taste a fresh fish dish or you can just lie under the warm Greek sun on the many beautiful beaches. In the village of Myrina, there are many organized beaches where the sun beds or umbrellas are easily available while there are good water sport facilities for the most adventurous. Apart from the places with archaeological interest that we have already mentioned, other places of interest include a Venetian Castle in Myrina and many museums. 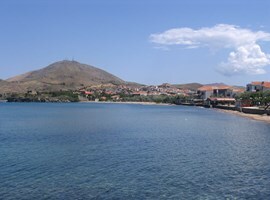 Lemnos has mainly a warm beautiful weather with a bright sunshine every day. The rainfalls are quite rare here while the hours after sunset offer a cool breeze. The island of Lemnos is surprisingly well equipped to handle tourists while at the same time the lack of tourism commercialization is obvious. The locals are extremely hospitable and friendly and one it’s sure; you have to try really hard to find any faults in this gorgeous island. The Castle of Myrina is an impressive Byzantine bastion which is located on the highest point above the town of Myrina, the capital of Lemnos. This castle was built in 1186 AC after the order of Andronicus Komnenos, a Byzantine emperor, on the remains of an ancient castle. The Venetians continued the construction of the castle in the 13th century, when they occupied Lemnos. The Castle of Myrina has its now form since 1200AC, by the Great Duke of Lemnos, a Venetian with the name Filocalo Navigajiosi. Inside the castle, the visitors can see a mosque which was created by the Turks who were living there during the Turkish occupation. When in 1770 the Russians tried to free the island from the Turks, unfortunately caused damage to the castle. Nowadays, the castle of Myrina is uninhabited by humans but is a home for about 200 deers! The local people care of them and provide food and water. If someone wants to visit the castle has to walk approximately 20 minutes on a beautiful path. The archaeological site of Ancient Poliochni is an ancient town, on the eastern part of Lemnos and is considered as the oldest European settlement and also as the oldest town of the Neolithic period in the entire territory of the Aegean Sea. The archaeologists have discovered four different settlements here, each one from a different period while they were built one on the remains of the previous. The oldest of these settlements seems to be built during the 4000BC. The ancient site of Kavirio is a temple situated 3 kilometres from the archaeological site of Ifestia. 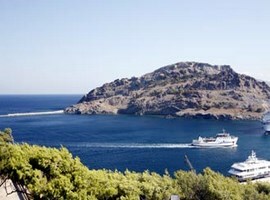 It is an ancient sacred place which was dedicated to Kaviri, two mythical gods of the northern Aegean. In this place were taking place plenty of mystic ceremonies known as the Mysteries. 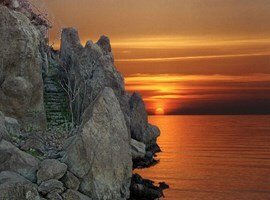 The sanctuary of Kavirio is considered to be built around the 6th or 7th century BC, a fact that makes it older than the sanctuary on the island of Samothraki where these gods were also worshipped. Also, it was strongly believed that Kaviri were the sons of the Olympian god Hephaestus, that’s why they were so talented technicians. The Mysteries of Kavirio were celebrated every year and they were the sign of the Nature revival. The archaeological site of Kavirio was discovered in 1937 and the excavations brought amazing finds to the light. A visitor can be really charmed by the beautiful ancient construction and the many ancient inscriptions that give a lot of information about the construction of the temple and the history of the island of Lemnos. The Cave of Philoctetes is a cave under the water, close to the archaeological site of Kavirio. Its name is after an ancient Greek hero who was abandoned on the island. According to a Greek myth, Philoctetes was the son of a king of Thessaly who was travelling with the rest of the Greek soldiers to Troy where later the Trojan War took place . Philoctetes was bitten by a poisonous snake during the hunting and the open wound was so bad that a terrible smell was coming out. The other soldiers couldn’t cope with this smell so Ulysses suggested that Philoctetes had to be abandoned alone on the island and finally that’s happened. So the rest continued their way to the town of Troy. For 10 endless years, Philoctetes was living alone in in the cave while he was suffering from horrible pains and the feeling of loneliness. The myth says that he used to put on the wound the Lemnian Gae, a kind of mud with ferric elements that according to the ancient Greek medicine had a good therapeutic power. The cave of Philoctetes is situated exactly under the archaeological site of Kavirio and the interested people can visit it both by boat and on foot. It is a beautiful cave with underwater streams which offer a serene atmosphere. 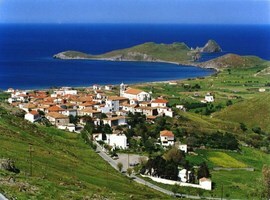 Zematas: this beach is located 40km away from the capital of Lemnos, Myrina near the site of Kavirio. 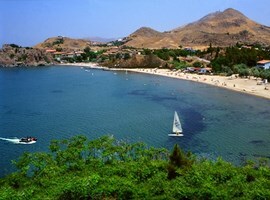 Zematas is one of the most beautiful and isolated beaches in the island of Lemnos. The visitors can enjoy many revitalizing and relaxing, combined with wonderful emerald waters. The people who come here take the opportunity to watch the gorgeous sunset on the beach of Zematas where the view is really clear and breath-taking. The beach has fine golden sand with the presence of some volcanic rocks. In the same area the sacred place of Kaviros and the village of Kalliopi are located. Also, near to the beach there are the unique lakes of the island; Hontarolimni and Aliki. Keros: this is a famous for its beauty and endless beach with white soft sand which is located 32km away from the capital of Lemnos. The beach of Keros is like a part of an earthly paradise, a place with turquoise colour waters which create an exotic scenery. On the beach the visitor is able to enjoy severe water sports as windsurfing and kite surfing. Doubtless this is the ideal place for the lovers of windsurfing, as the beach is affected by the strong winds offering the best conditions for this adventurous watersport. Because of the long distance away from the centre of Lemnos and the strong winds, the beach of Keros is not crowded like other beaches. In the area, there are only a few (but with good quality) tourist facilities for accommodation and a few taverns by the sea as the place is a protected ecosystem. Thanos: this beach is located very close to the village of Thanos and is a really fantastic beach with soft golden sand. The beach of Thanos is partially organized offering umbrellas and sunbeds. The beach offers also nice secret spots so visitors can enjoy the total privacy, relaxation and calmness. The beach is located just 4km away from Myrina and is surrounded by impressive volcanic rocks while the water has a unique azure colour. The visitor can find many choices for accommodation and few taverns and eating houses with delicious local tastes. The village and the beach of Thanos is ideal for all but especially for families as it’s not too crowded and not too isolated. Lemnos has an airport so someone can access it by plane or by the classic way by sea. The airport of Lemnos is located 22 km away from the capital town Myrina and accepts frequent flights from the cities of Athens and Thessaloniki. The flight time lasts for about 1 hour. If someone chooses to travel by sea has to know that there is no ferry directly from the central port of Piraeus to the island of Lemnos. Ferries to the island of Lemnos start from the port of Lavrion in Attica which is located close to the cape of Sounio (60km away from Athens and 36km from the International Airport El. Venizelos). 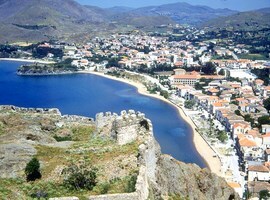 Lemnos is also connected with ferries to the cities of Thessaloniki and Kavala in northern Greece.